The lovely but hard to find red-haired Dramatic Living Barbie doll was only available in the United States as a Sears Exclusive gift set. She was also sold separately in Japan. This doll differs a bit from the Dramatic Living Barbie’s with the “Taiwan” marking that we are all used to seeing. She has a little bit longer hair that’s a darker red color. She has the same body, pretty face, and rooted eyelashes as the Taiwan doll, but what sets her apart is her “Japan” marking. These active dolls can pose in almost every way possible. Her original box says: “My elbows, knees and ankles bend, my head, hands and waist turn, my arms and legs swing up ‘n around!” What a perfect doll to use for this action set. If little girls were looking for an excellent group of athletic clothes for Barbie, then the #1585 Action Accents was the one to buy! This exclusive Sears gift set was only sold in the United States in 1970 and 1971. The collection included the doll and sixteen sporty items for all her many adventurous activities. The doll came with a wrist tag, clear stand, and was dressed in her hot-pink leotard with matching tights for working out. She even had a workout rope to use for resistance. For skiing she wore her same tights and leotard, but added a vinyl pink and orange ski jacket. There were a set of skis, poles and boots, too. For snorkeling in the turquoise waters of the Caribbean she had her fins, mask, snorkel, and a one-piece orange and blue swimsuit. For ballet performances she wore her pink leotard and tights along with a pink tutu and ballet slippers. When she went ice skating in Central Park she wore her tights and leotard again, but this time added her blue skirt with straps that was trimmed with pink faux fur along the bottom. A pink furry hat and matching blue ice skates completed her outfit. 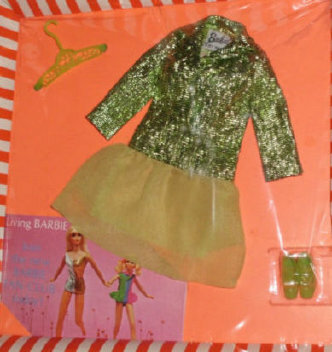 This Action Accents Living Barbie was sold separately in Japan. She came dressed in her pink leotard and tights. 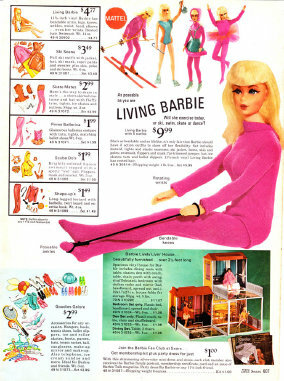 Only the gift set was sold in the U.S.
1970 Sears Christmas Catalog Ad for #1585 Living Barbie Action Accents. She sold for $9.99 and she never came with blonde hair!